Today I was planning to write an entry about Free RPG Day, which was on the 14th, then I got an email from Drive Thru RPG that my copy of Crawling Under a Broken Moon #2 had been released and I fell down the rabbit hole of post-apocalyptic roleplaying. Post-apocalypse is one of my favorite RPG settings. I own every edition of Gamma World, Metamorphosis Alpha, Mutant Future, Aftermath, Hell on Earth, The Morrow Project, Darwin's World and even Alpha-Omega. I wrote my own magic and technology post-apocalypse rpg and a Gamma World conversion both based on Runequest. I should write blog entry on those. I assure you they are completely awesome. Post-Apocalypse and science fantasy rpgs are seeing a renaissance right now. Numenara was released last year, the Metamorphosis Alpha kickstarter was a huge success, a DCC version of Gamma World called Gamma Crawl Classics is under playtest, and the Paizo folks have even given us their take on the setting with "The Land of the Fallen Stars." 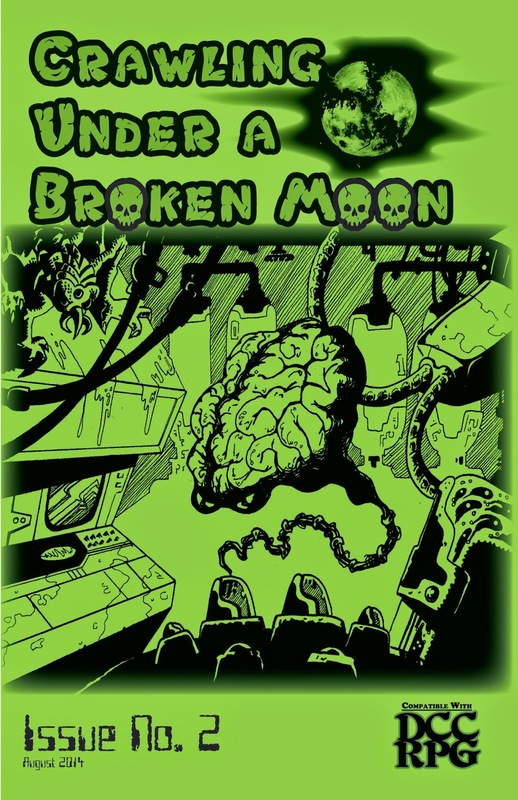 Crawling under a Broken Moon is a zine for the Dungeon Crawl Classics RPG. It's based on a post apocalyptic world that you might be familiar with from the 80s. I am a huge Thundarr fan. I remember watching it over and over on Saturday mornings when I was a kid with my brother. We even had a special stick that we found in the backyard that was our "Sun Sword." The love the DCC rules too: the funky tables, luck, spell burn, corruption, deity disapproval, deeds of arms, the "funnel," the whole crazy thing. My DCC game kinda fizzled out a while back. My group liked playing the 0-level peons through the funnel, but once they were 3rd level, they seemed to lose interest. DCC was the first "OSR" game that I ran and I wasn't really sure what to do with it. The rules are vague, the characters are all wildly unbalanced and some of the adventures are just plain weird. I tried to run it to "straight," like I was playing D&D 3E. That's not the way to run DCC. To run DCC you must embrace the gonzo. "Oh you rolled a 20 on your web spell? You webbed everything and everyone within 100 yards. What now?" Most of my old DCC group has since become a thriving Dark Heresy group so it all turned out well. DCC is a perfect fit for a Thundarr game. The sorcery is right there, and the super-science is easily added. The first issue of Broken Moon does the tech for you. It has rules for modern weapons and a new class that specializes in Tech. The second issues adds in mutants and mutations. (In true DCC random table style.) Each issue also has a section called "Interesting Places to Die," which describes a full adventure location. The second issue's location is "The Floating Tower of the Cyberhive," which I will definitely be using at some point. Once +Reid San Filippo puts out a few more issues I I'll have to try and con a few folks into a game. If you're an OSR fan but not into DCC, make sure you check out +Tim Snider's superb Thundarr conversion for Mutant Future over at the Savage Afterworld. His Thundarr session was my favorite game from NTRPG con this year. When I run a Thundarr game it will be a glorious mash up of Tim's stuff and Crawling Under a Broken Moon. Also, watch "Lords of Light," the short documentary on the making Thundarr. Did you know that Jack Kirby, yes, THAT Jack Kirby, did some of the writing for Thundarr? From January of 2003 to June 2012, I wrote a blog named Channel Zero. The blog didn't have any kind of theme. It was a personal journal like lots of blogs back in the days before social media. I stopped updating for a lot of reasons, however I'd always wanted to start a themed blog about role playing games. I just never got around to it. Well now I have. I am relaunching Channel Zero as an RPG blog. At North Texas RPG Con, I got the chance to meet and talk with many RPG bloggers at and it inspired me to finally sit down and write. My plan is to write about Old School Renaissance (OSR) games, but I'm certain I will stray to a few other RPGs and probably a few war games. I've been playing Warhammer 40k since I was 14 years old, I don't see that changing anytime soon. Enough narrative, on to the RPG stuff. A commenter on the original Channel Zero blog once asked if I named the blog after the Public Enemy song "She Watch Channel Zero." I didn't get the name from the song though, I got it from an obscure superhero RPG called Underground published by Mayfair games. Underground was a pretty crazy RPG. The background is somewhat complex. In Underground, the characters play genetically modified mercenary super soldiers who are brain washed into believing they are superheroes. When discharged from their mercenary duties the heroes end up as part of the "Underground" and fight against the oppressive US police state and the corporations. The 90s were a weird time. In the game, the rebel superheroes used a pirate TV channel, "Channel Zero," to broadcast their message. I thought Channel Zero sounded cool and took it for my blog. Turns out, the designers of Underground are Public Enemy fans. The band figures prominently in the game's back story. So I'm guessing they did get the Channel Zero idea from the song. I never ended up running the game. I liked the comic books Underground was based on a lot more than the RPG. Underground is still available in PDF from Drive Thru RPG. Mayfair made quite a few supplements for it, so it must have been somewhat popular. I owned the rule book and the Notebook supplement, but I don't have them now. I kinda wish I did, because writing about it is making me want to check it out again.